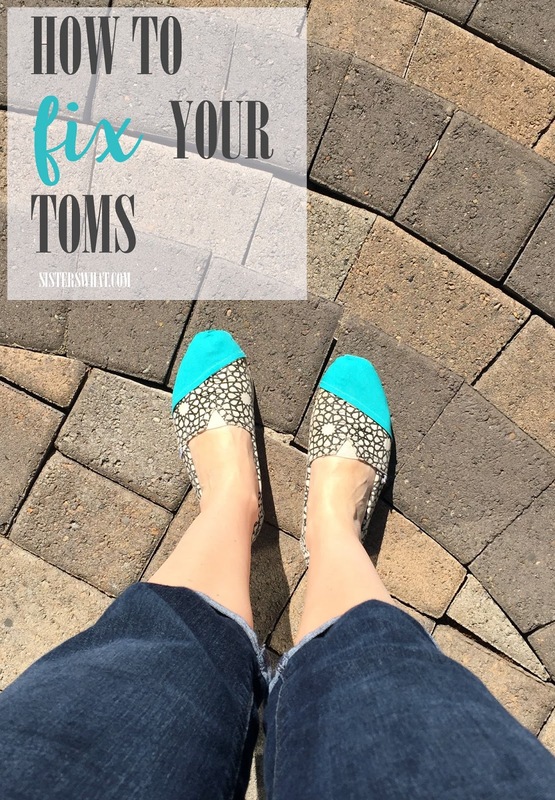 ' How to Fix and patch Your Toms - A Tutorial - Sisters, What! First I have to say I love my TOMs. I wear them more then any other shoes, for me they are my most comfortable shoe. 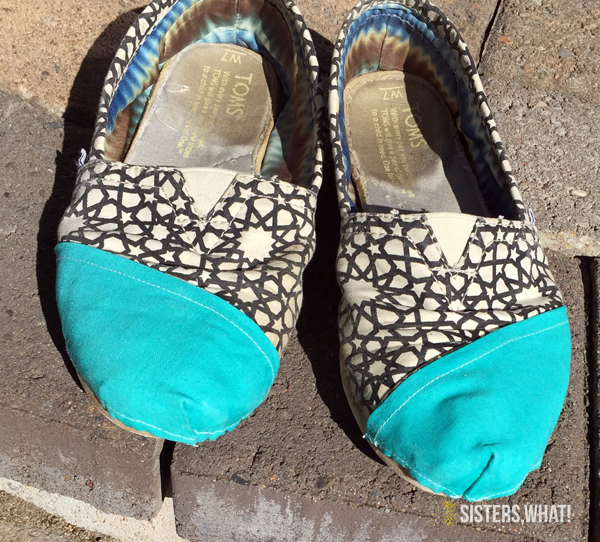 So when these TOMs (my first pair) got holes, I quickly got a new pair but couldn’t throw them out. They don’t make this pattern anymore. And now that my second pair is starting to wear out (they are almost 2 years old), I knew I needed to figure out a way to save both pairs. I do have 2 other pairs, I know, I know, I have a pair I bought for my wedding reception so they are nicer and not every day ones. And I have a pair that is more of a tennis shoe, with laces that my boyfriend (now husband) bought me for christmas. So I am glad to have found a way to repair my first pair and reuse them. Favorite fabric - the thicker the better. I doubled mine over because it was just a regular fabric. I just bought a fat quarter at Joann’s and that was plenty. I first cut a piece of the iron on patch to cover any holes in my TOMs. On one shoe I only had a small hole to patch, the other one it was larger. I then Ironed on the patches to my shoes. If there are holes that go completely through make sure you put a piece of paper on the inside of the shoe so it does stick to the inside. I had a whole where my big toe poked through. 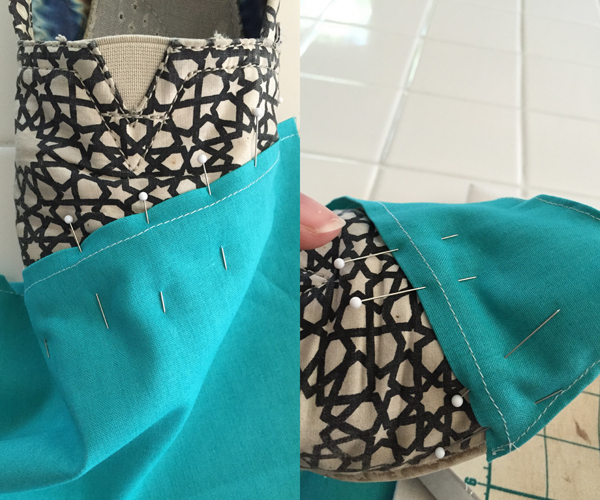 I doubled up my fabric in half and sewed a 1/4 seam along the edge. 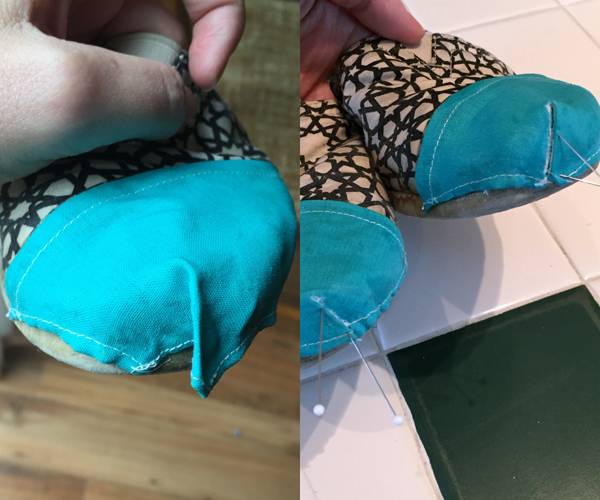 I did this to mimic the seam along diagonal front of the shoe. 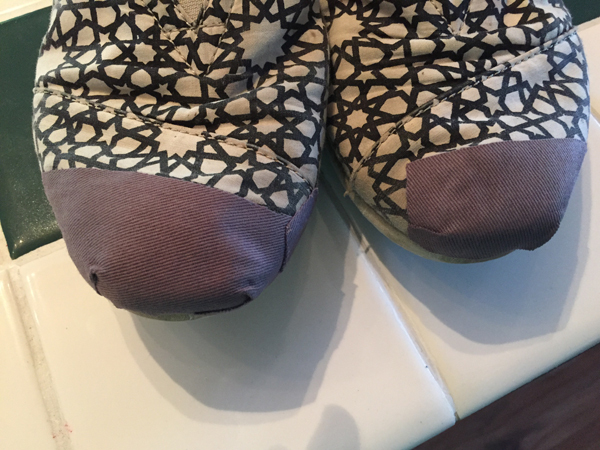 I pinned the seam on the fabric along the seam on my old TOMs. 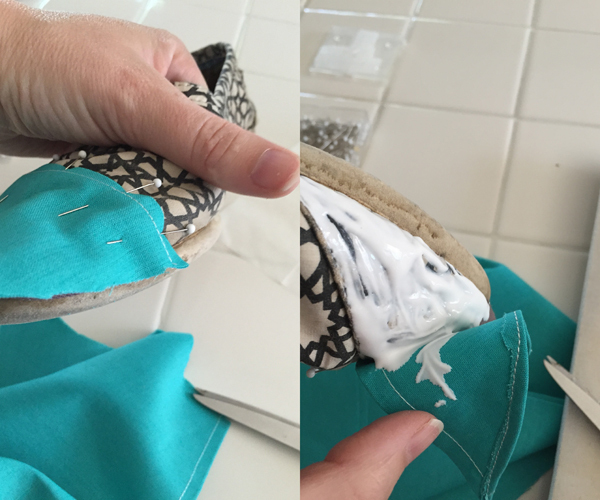 I carefully cut along the front bottom of my shoe to make sure I left a little extra fabric. I then created a hem along that cut line by folding over 1/4 seam and sewing. 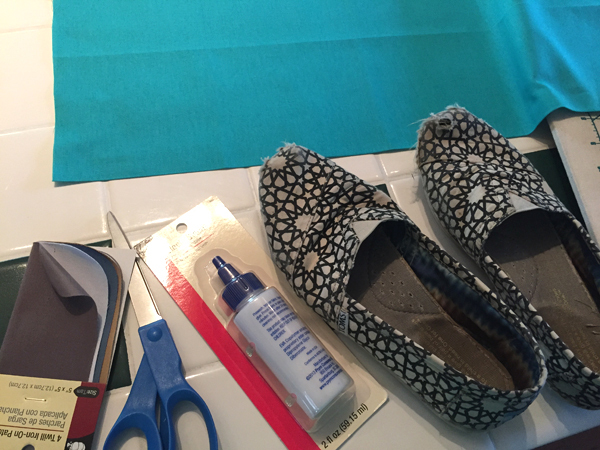 I again pinned the fabric back to the shoe making sure everything matched up. Leaving half of the pins in I unpinned one half and spears fabric glue over my TOMs. I pressed the fabric down smoothly and then let dry. After the glue had dried, I removed the other pins and did the other side of the shoe in the same way. At this point you will probably have some extra fabric in the front. I created a pleat or fold out of this fabric. I let the fabric glue dry before I then glued the pleat or fold down. I put some pins in it while it dried to make sure it stayed.